It is my pleasure and privilege to welcome one of my favorite people, writers and storytellers to Triple P. My dear friend Undine, who long time Brethren will know from her insightful and delightful World of Edgar Allan Poe blog, as today’s anniversary guest blogger. You can also follow her on Twitter. Don’t miss a word of today's post; they’re all worth savoring. For an Edgar Allan Poe devotee such as myself, the strange and bloody goings-on aboard the good ship “Glendower” have an irresistible fascination. Here we have a murder claustrophobic enough to unsettle Hitchcock, strange enough to make Dame Christie throw up her hands, and impenetrable enough to baffle Poe’s M. Dupin. It resembles the Lizzie Borden case, in the sense that we think we “know” who committed the crime in question, but we can never truly know. Also like the Borden murders, the complete absence of discernible motive leaves one deeply disquieted. If the captain of the “Glendower” could be slaughtered in such an apparently pointless fashion, who among us is safe? Our tale-without-a-moral began on June 9, 1911. The “Glendower,” a coal barge that had seen seventeen years of service, was part of a three-ship flotilla. The captain was fifty-five year old Charles Wyman, a man with a long, and so far as is known, perfectly commendable history at sea. His three crew members, William DeGraff, William Nilsen, and Antonio Priskich, seemed both hard-working and respectable. The vessel appeared to be approaching its scheduled destination of Newburyport, Massachusetts without incident. The first sign of trouble came at about eight in the evening, when the barge began whistling. It sent out signals indicating it wanted the “Monocacy,” the tug that was leading it, to change course and come alongside. Camp was understandably stunned by the news, but he assumed Wyman had died of some unexpected, but perfectly natural causes. Before heading to shore and notifying the police, the flotilla dropped anchor and he attempted to question DeGraff further. In response to these inquiries, the cook said that Wyman had evidently died around noon, casually adding the information that “there was blood in the bunk, too.” He invited Camp to come aboard and inspect the corpse himself. Camp declined—he probably already suspected by this point that events were becoming far too weird for him to handle alone—and the ships made their way to Boston, where he went ashore to file a report with the police and the local coroner. It was not until dawn of the following day that the Suffolk County medical examiner, Dr. George Magrath, accompanied by several policemen, went aboard the ill-fated barge. DeGraff greeted them quietly. DeGraff, a sailor for nearly forty years, had joined the crew of the “Glendower” only a month before. DeGraff ‘s background was and is a puzzle—virtually all we know of him is contained in the previous sentence—and although he was a strongly-built man with powerful arms and shoulders, he was also extremely hunchbacked. His strange, oddly composed figure only compounded the grim atmosphere of the scene. The visitors found Wyman’s body lying face-down in his bunk. He was wrapped in a blanket, which was heavily bloodstained. Drops of blood also covered the area around him. His head had been repeatedly battered with what was believed to be a hatchet or large club. Dr. Magrath found a hammer loosely held in the dead man’s hand. It was, however, bloodless, proving that it had been placed in Wyman’s hands after the blood on them had already dried. It did not take a forensic genius to realize this was not, as Camp had assumed, a stroke or heart attack, or even a suicide. When Magrath and the patrolmen questioned the crew, they obtained little helpful information. The trio insisted that there could not have been anyone but themselves aboard ship, and they all professed complete ignorance of how their captain met his violent end. The policemen made a minute search of the little barge, without discovering a single clue to help them solve the mystery. The crewmembers were all placed under arrest and brought ashore. It was noted that DeGraff, unlike his obviously confused shipmates, was quietly wary, taking careful notice of all that went on around him. 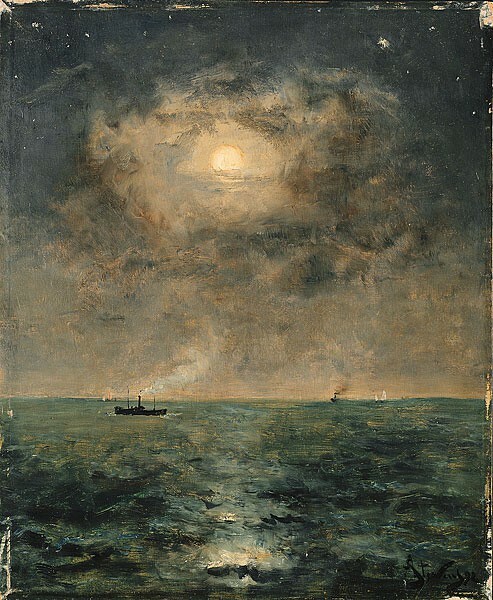 When the trio faced a Boston Grand Jury, it was brought into evidence that while Nilsen and Priskich bunked some distance away from the captain, DeGraff’s cabin communicated with Wyman’s, enabling him to clandestinely enter Wyman’s quarters. It was also revealed that the other two survivors of the “Glendower” were continuously alone together during that fatal afternoon, in a different part of the ship. It was judged to be a ridiculously easy case to solve. There appeared to be literally no one in the world who could have killed Captain Wyman but his crippled cook. DeGraff went on trial on February 19, 1912. Testimony showed that DeGraff called the men to meals by ringing a bell. Three of them ate at a time, while the fourth manned the wheel. On the day of the murder, Nilsen was at the wheel for the midday meal, which was served at eleven. Priskich was with him until the dinner bell rang, and DeGraff arrived for his turn at the wheel. Wyman ate a full meal and retired to the chartroom, which adjoined his cabin, shortly before twelve. It was the last time anyone admitted seeing him alive. Nilsen took the wheel at noon, and Priskich went to the engine room, where it was impossible for him to reach Wyman’s cabin unobserved. DeGraff went somewhere below deck, where he was unseen by Nilsen or Priskich until close to five PM. Around one-thirty Nilsen thought he heard a groan or cry, without being able to place its source. (Some vaguer accounts state he heard an angry cry of “Get out of here!”) Doctors who examined the murder victim believed that what he heard were the last sounds made by Captain Wyman. At two, Priskich took his place at the wheel. Nilsen testified that he briefly rested in his bunk, and then rejoined Priskich. From then until the four-thirty supper time, the pair were constantly within sight of the other. Supper was—for the first time—late, by about fifteen minutes. DeGraff came to take the wheel, and Nilsen and Priskich went to eat. They were surprised to find the captain was not there. After waiting fruitlessly for a while, they went to question the cook about what they should do. DeGraff told them indifferently to go ahead and eat—the captain would turn up eventually. Priskich knocked on Wyman’s door, but got no reply. After the two men ate, they again consulted DeGraff about their increasing unease with the situation. The cook, with the same air of nonchalance he displayed throughout the entire story, dismissed their worries. When Priskich pointed out that Wyman was due to take the wheel at five, DeGraff replied that he himself would take the captain’s place. However, after Priskich left to look after the engines, the cook told Nilsen to take over the wheel, as he had to clean up after the meal. “Sure, he died,” DeGraff replied. “He died long ago, for I took his hand like this,” holding his left wrist with his right hand. The weapon that killed Wyman was never found, and no blood was on the clothing of the three survivors. However, only one of DeGraff’s aprons—freshly washed and unused—could be located. At DeGraff’s trial, the prosecution’s main difficulty was establishing motive. They found two witnesses who testified that DeGraff had said Wyman was “no good,” and that he had sworn to kill him. These men were unable to give any reason for the cook’s reputed hostility, however. When DeGraff himself took the stand, his testimony was terse and unenlightening. The best his attorney could do for a defense was to suggest that a stowaway had secretly hidden aboard ship, slaughtered the captain for reasons unknown, and then managed to jump overboard and swim to shore unseen. The prosecutor, on the other hand, was able to establish that DeGraff was the only one on the ship who had the time and opportunity to commit the crime. He also pointed out that the murder must have been done by someone familiar with Wyman’s habits, and surely some secret lurker would be unable to know when the captain would be invisible to the rest of the ship. By the morning after both sides had rested their case, the jury reached a verdict: “Not guilty.” Evidently, the prosecution’s inability to prove why DeGraff would wish to kill his captain so deliberately and violently outweighed everything else, as far as these jurymen were concerned. They also likely found it difficult to picture such a calm, nondescript figure in the role of wild butcher. DeGraff left the courthouse, and disappeared into history. Some believed he changed his name and went on with his life at sea, but his subsequent history remains as shadowy as everything else in this case. There is a legend that, immediately after DeGraff was freed, he confided to someone who had struck up an acquaintance with him during his imprisonment the story of his murder of Charles Wyman. The tale said that many years before, when DeGraff was a strong, healthy young man, the brutal Wyman had attacked him, causing him to suffer a fall that left him permanently crippled. DeGraff waited decades to take his revenge, biding his time until Wyman had forgotten him and the tragic incident. Aboard the “Glendower,” he finally found the opportunity to settle scores. This slice of Gothic melodrama is almost certainly the product of an enterprising journalist or overly imaginative local blowhard, but in the absence of any other explanation for what happened that gruesome day on the “Glendower,” it has lingered ever since. Cahill was convinced that the barge used to construct the building was none other than the remains of the “Glendower,” complete with the restless, un-avenged spirit of its murdered Captain. “It sounds,” he wrote, “like the ‘Glendower’ was kind of a hoodoo vessel.” This is certainly as good an answer to the mystery as any. In any case, let us pay tribute to the otherwise unmemorable William DeGraff. This quiet, unassuming little cook may well have been as mad, bad, and dangerous to know as the most bloodthirsty pirate. Once more, my appreciation to Undine for making Triple P's third anniversary all the more special! 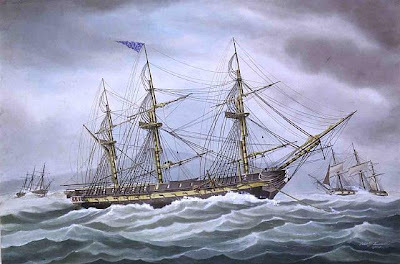 July 29, 1813: One of America’s original six frigates, USS President of 44 guns and captained by John Rodgers, captures and burns British brig Alert during the War of 1812. Today's word is used at sea in reference to everything from hairstyles to tricky maneuvers. A more versatile word, one might say, you could rarely find. In the hairstyle way, we first must mention that many sailors during the 18th and early 19th century were averse to cutting their hair. Like Samson, they felt that a certain amount of their virile nature was carried in their flowing locks. Of course aboard ship, where rigging and blocks can catch and tear at one's tresses, simply allowing long hair to flow free was out of the question. To remedy this, men wore their hair braided down their backs often asking a mess mate to braid it for them after it had been washed. Sometimes the braid was tarred to make it even more resilient. When these braids were very long, they were still a hazard and men turned to "clubbing." Much like dandies at European courts, who doubled their long ponytails at their necks, a sailor would fold his braid in half and tie it up at the nape of his neck. This insured that it was both out of the way and safe from quite literally being ripped out at the roots. Triple P's favorite literary Captain, Jack Aubrey, wore his long, blond hair clubbed - though not usually braided - throughout the O'Brian novels despite the vogue for short haircuts a la Napoleon at the time. Club law was the British and Colonial American term for the rule of strength. He who carried the biggest club, and was unhampered by empathy for those he wielded it against, was in charge. Rarely the case aboard naval ships or privateers, one might imagine this type of superiority finding a place at the docks. Or aboard the occasional pirate vessel. Clubbing was the term given for drifting along a current with an anchor out. Clubbing the fleet was an English term for placing the first division of a squadron to the windward. 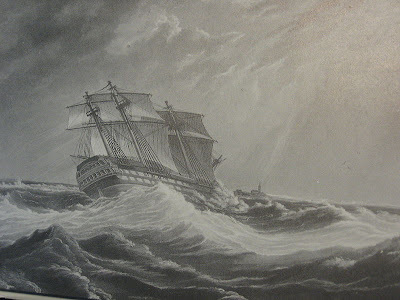 A method of tacking a ship by letting go the lee-anchor as soon as the wind is out of the sails, which brings her head to the wind, and as soon as she pays off, the cable is cut and the sails trimmed; this is never had recourse to but in perilous situations, and when it is expected that the ship would otherwise miss stays. The most gallant example was performed by Captain Hayes in HMS Magnificent, 74, in Basque Roads, in 1814, when with lower-yards and top-masts struck, he escaped between two reefs from the enemy at Oleron. He bore the name of Magnificent Hayes to the day of his death, for the style in which he executed it. And you really can't argue with that. Finally, on a personal note, today is Triple P's anniversary. It was July 28, 2009 when I began this labor of love, and I love it to this day. Enjoy your Saturday, Brethren, and be sure to stop in on Monday when we'll have a delicious treat from generous and talented writer, scholar, blogger and long time friend of Triple P, the radiant Undine. You won't want to miss it. First off, I'm back. Things are progressing slowly and quickly all at the same time, but I'm feeling better and ready to tackle Triple P once again. It's hard to stay away from something you love. Thank you each and every one for the support and positive energy you have channeled toward me and my family. It is helping. A lot. Second, Triple P has received a complaint from an anonymous party - via Blogger - that I have infringed on someone's copyright. How the infringement occurred and even what specifically, be it a picture, a paragraph or a thought, was infringed on is unknown to me. As I have discovered, Blogger's process completely protects the complainant and puts the onus of proving a negative squarely on the shoulders of the blogger - me. Which is fine given that it is standard procedure. For me personally, however, it is unnerving only because I have never intended to infringe upon anyone's livelihood or intellectual property. For the record, Triple P operates under a Creative Commons U.S. License as noted on the sidebar. I attribute whenever possible, giving credit for quotes and pictures used in my posts if I know their origin and providing links whenever possible. I do not receive monetary compensation for this work as per the CC guidelines. If credit is not appropriately given, I welcome comments to that effect that will allow me to do so. I understand that the definition of copyright, particularly as it applies to images used on the Internet, is changing. Any line I may have crossed, if that is indeed what happened, was purely unintentional. At any rate, I have deleted the post and filed the appropriate form with Blogger. What will happen next, I have no notion as, again, the source of the complaint remains unknown to me. Finally, a Happy Friday gift to you all from Triple P: SS Pin Up by the inimitable Jay Scott Pike (via American Gallery). What better way to kick off the weekend? I had hoped to put up a "real" post today but, most unfortunately, things are happening very fast aboard our ship. I have been diagnosed with cancer and will be undergoing a left-sided mastectomy and ovarictomy tomorrow morning. Because of the unknowns surrounding my recovery time, Triple P will be on hiatus until further notice. One of my greatest joys is researching and writing the posts I offer here, along with all of the Brethren's wonderful feedback and support. At this time, I ask only for your continued support as my family and I sail on into unknown waters. I'll be back sooner than later and until then, please enjoy the archives. 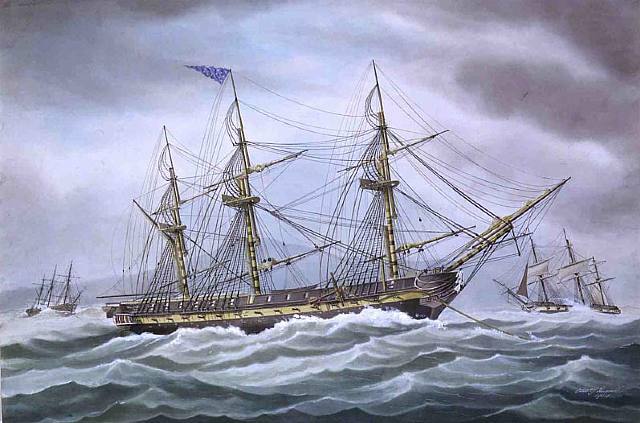 July 8, 1787: The Royal Navy renames the full-rigged ship Bethia, built in 1783. She is commissioned as HMS Bounty. Two years later, while cruising in the Great South Sea, she will witness one of the most infamous mutinies in naval history. Let is a word heard aboard ship in conjunction with an order, more often than not. But it is also the first three letters in one of our favorite terms here at Triple P: letter of marque. More on that in a minute. Let draw was the order to let the sails draw wind over the lee-side when tacking. Let go and haul, a similar order, meant it was time to haul the head yards around by the braces to facilitate tacking. This might also be verbalized as afore haul . 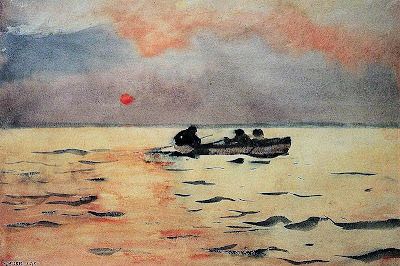 Let run was an order to cast a boat off and let fall to drop a sail in preparation for setting it. Let fly is sometimes used in nautical fiction and movies as an order to reveal a ship's true colors or, more commonly, to fire cannon. This was in fact an order to quite literally let go of or drop a rope. Let drive is a more period accurate order for firing the guns up until the late 19th century. 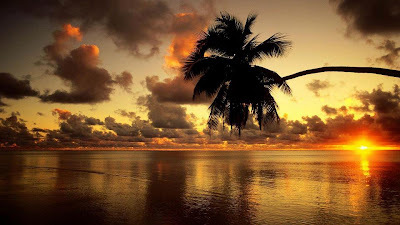 To let out a reef, sometimes to shake out a reef, is to untie the points to allow more sail to catch the wind. Let pass is an order or, in some cases, simply a allowance for one ship to pass another. This was usually an issue of hierarchy; a commodore's ship would pass a ship carrying only a captain, while a rear admiral's or admiral's flag would pass the commodore's ship. An anchor is often dropped under foot when calm prevails and the drift would be towards danger. To drop an anchor under foot, is to let it go and veer a little of the riding cable when the coming home, or parting of the one by which she is riding, is feared. All navy ships kept and continue to keep what was known as a letter book. This held copies of all letters and orders written by the captain for the duration of any given cruise. This would document the captain's performance should any irregularities be found or reported upon returning to port. A letter of marque, also appropriately referred to as a letter of reprisal or a letter of marque and reprisal is every pirate's fondest dream. Issued by governments during war time, this document made legal the taking of enemy ships as prizes by any ship holding one. According to what we might today refer to as international law governing the granting of letters of marque, no ship could hold more than one letter of marque at a time, and only ships from the enemy country state on the letter of marque could be legally taken. These ships would need to be brought to the home port of the letter of marque ship to be libeled by a court of law. In practice, of course, the gray area between which ships were legal prizes and where and how they had to be libeled became very broad indeed, particularly during the age of great revolutions. 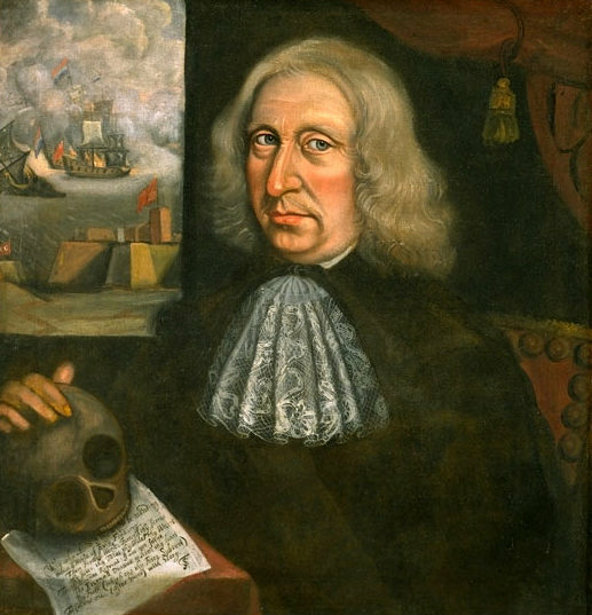 Roughly from 1775 to 1825, and most noticeably in the Americas, who was a pirate and who was a legal privateer became more of an issue of government opinion than international law. Because of this, most governments discontinued the practice of issuing letters of marque and reprisal by the mid-19th century. The last great surge of privateering occurred during the American Civil War, largely because the Confederate States had no navy and needed to rely on private ship owners carrying Confederate letters of marque for such duties. And that is a good place to let today's post go, so to say. Happy Saturday, Brethren; swift chases and fat prizes may you always find. 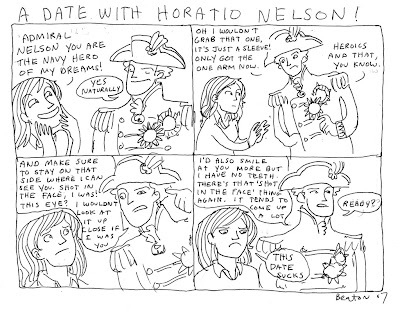 Today, Friday Booty at Triple P brings you one of my favorite comic artist's take on one of my favorite naval heroes. 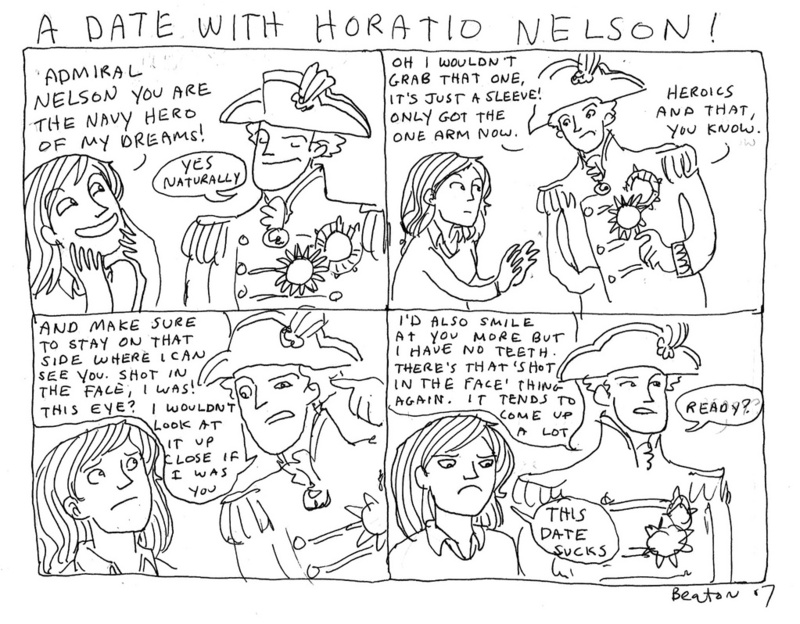 The very talented Kate Beaton gives us a glimpse of her experience on "A Date with Horatio Nelson". Clearly, things didn't go as planned. Happy Friday, Brethren. I owe you all a big thank you for your continued support, insightful comments and tenacious loyalty to a subject near and dear to me and mine: all things seafaring. 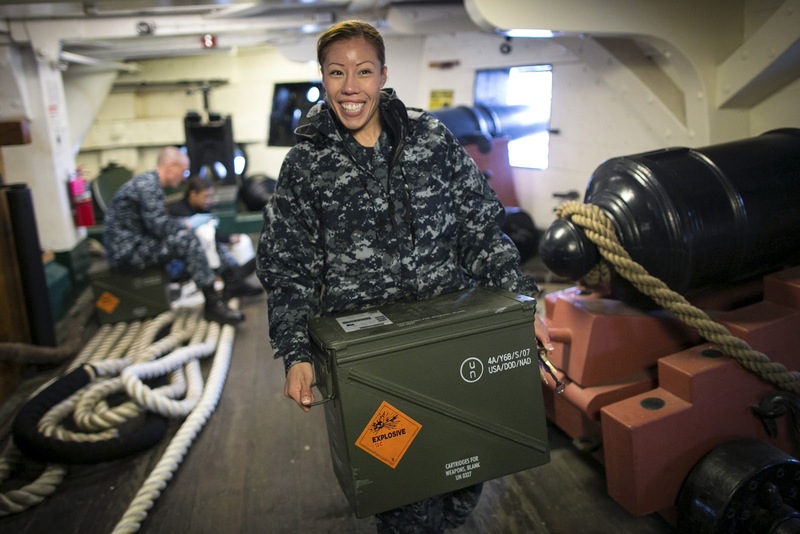 Though I know that "Privileged to Serve" is generally a motto of the U.S. Army, this wonderful article from the Boston Globe on line makes it clear that the members of the U.S. Navy who work the oldest commissioned warship afloat feel very privileged indeed. USS Constitution - the fabled Old Ironsides - carries a crew of 60 sailors and each and every one is honored to serve aboard her. The quotes in the article are fascinating as we learn about men and women who have seen duty in such far flung places as African, European and Asian ports of call literally "jump at the chance" for a spot aboard Constitution. What better way is there to learn about our nation's naval history? This is where it all began. The Constitution is one of the ships that said to the world that America wasn't fooling around when it came to the Navy. Constitution is a working sailing ship and, though it is a rare event to find her sailing past the outer harbor in Boston, she is on the water at least six times a year. That means that all the modern sailors assigned to her need to handle her rigging and sails just as their ancestors would have. To this day, Constitution even has a master at arms which was one of the original positions in the U.S. Navy. It would probably come as a surprise to men like Stephen Decatur, James Barron and David Porter that the position is today filled by a woman, Marina Chavez. Other things have changed too; as Chavez notes, one of the master at arm's duties originally was to assist with flogging. "No longer part of my job description," she says. If you'd like to know more about Constitution's participation in events celebrating the bicentennial of the War of 1812, or just find out the museum's hours, check out their official website. Posterity! You will never know how much it cost the present generation to preserve your freedom! I hope you will make good use of it. If you do not, I shall repent in Heaven that I ever took half the pains to preserve it. To bring that into modern terms, allow me to quote another righteous American, RuPaul: "Don't f**k it up." Above is a wall in a water basin behind English Harbor. The site is on the Caribbean island of Antigua where the Royal Navy had a base throughout most of the 18th century. Posted by Navy Records in the UK on their Twitter feed last Friday, this amazing picture shows graffiti left behind by sailors in port. 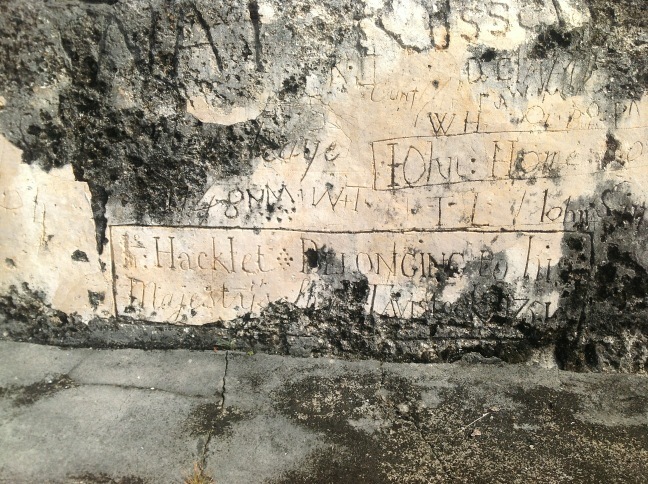 The approximate dating of this wall's scrawls and scribbles is between 1740 and 1780. Leaving a little bit of themselves behind, a few anonymous seamen have also left us a remarkable and invaluable treasure. And that is our good fortune indeed. And quiet sleep and a sweet dream when the long tick's over.